To celebrate my promotion, Steve and I had an impromptu dinner at Kirkland Tap & Trotter, Tony Maws’s (Craigie on Main) new restaurant. The dining room was packed and loud, but we had a nice corner table for people (and food) watching. 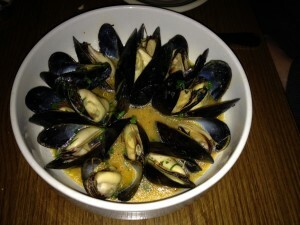 We shared the Maine mussels ($13) to start; they were large, plump and tender, bursting with briny goodness. The server gave us plenty of bread to sop up the delicious garlic saffron broth. My only complaint is that the serving was small. 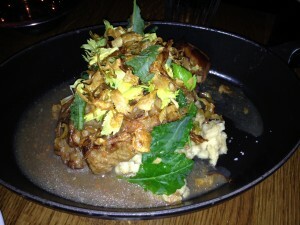 Next was the roasted veal chop ($28) served with celery root mash. I thought the chop was wonderful; it was succulent and beyond tender. Steve thought it was only “OK” and that it lacked in flavor. I told him he was crazy – the chop tasted like bring wrapped in a blanket in front of a roaring fire while snow falls outside, if that had a flavor. We got a side of duck fat Brussels sprouts ($8). The duck fat did not add much flavor, but the sprouts were cooked perfectly. Our server was friendly and attentive, despite the crowded room. Steve enjoyed his beer and I, uncharacteristically got a shot. There are a lot of menu items I would love to try, so I plan to be back.